EL PASO, Texas – A $2 million grant from the Cancer Prevention and Research Institute of Texas (CPRIT) will allow Texas Tech University Health Sciences Center El Paso (TTUHSC El Paso) to create a new lab focusing on breast cancer, pushing forward breast cancer research in West Texas. The lab will be headed by Shrikanth Gadad, Ph.D., a CPRIT Scholar recently recruited to TTUHSC El Paso. The research planned for the new lab perfectly complements the cancer research already happening at TTUHSC El Paso's Center of Emphasis in Cancer, said Rajkumar Lakshmanaswamy, Ph.D., scientific director of the center and dean of the Graduate School of Biomedical Sciences. Lakshmanaswamy's research at the Center of Emphasis in Cancer has focused on the types of genes that make proteins. Gadad's research will focus on long noncoding RNAs, which are genes that do not make proteins. This type of research is relatively new and increasingly important. "The concept that Gadad is bringing in is really new, and it will help us understand the process of cancer growth and how it becomes aggressive," Lakshmanaswamy said. "Using that, we can actually come up with some strategies to prevent the growth of these cancers." As a CPRIT Scholar, Gadad's recruitment to El Paso as a first-time tenure-track faculty member is a first for the Texas Tech University System and for West Texas. 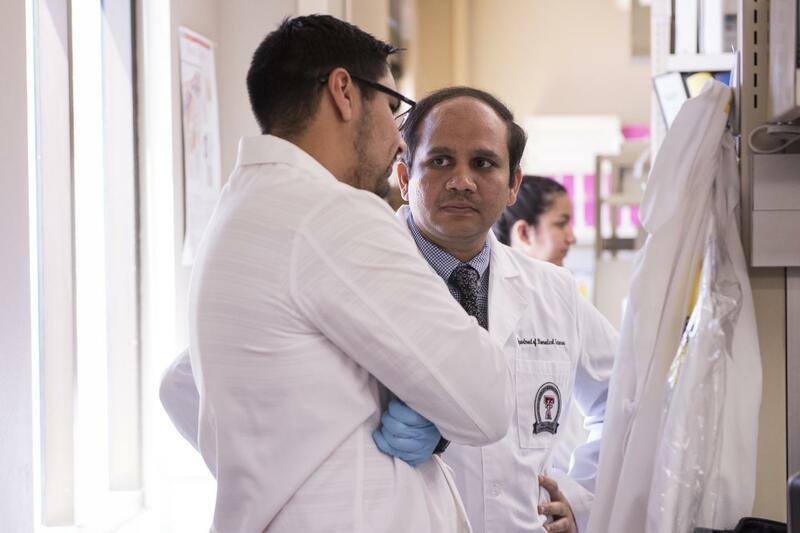 Gadad's lab will serve as a crucial link between world-class research and cancer prevention services, complementing the work of Navkiran Shokar, M.D., M.P.H., M.A., vice chair for research and director for cancer prevention and control at TTUHSC El Paso. Dr. Shokar is a CPRIT Prevention grant awardee who has established and expanded a breast cancer screening program for underserved West Texans. El Paso Mayor Dee Margo, who also serves as Assistant Presiding Officer of the CPRIT Oversight Committee, said Gadad's recruitment is important for El Paso and the Texas border region. "Having CPRIT Scholar Shrikanth Gadad recruited to TTUHSC El Paso demonstrates our city's status as a serious player in life-sciences research," Margo said. "Cancer disproportionately affects Texans on the border, and this requires us to build a stronger, cancer-fighting ecosystem right here to study how best to address these disparities. I congratulate Dr. Gadad and the entire team at TTUHSC El Paso on this milestone in developing a world-class cancer research program." Students at TTUHSC El Paso's Graduate School of Biomedical Sciences will be fully involved with the new lab and Gadad's research. "The research projects that will be conducted in Gadad's lab will always involve the graduate students in the lab doing research," Lakshmanaswamy said. "They will be doing one-year research stints in his lab, which is a requirement for their program. So, students will be constantly working in his lab, working on the project that has been funded by CPRIT." TTUHSC El Paso was able to recruit Gadad thanks to the CPRIT Scholars recruitment grant, designed to assist Texas universities in attracting outstanding scientists to their cancer research programs. Gadad was awarded $2 million through the fund's First-Time, Tenure-Track Faculty Members program, which supports emerging investigators pursing their first faculty appointment. Gadad said his long-term goal is to connect his research to the community, looking at how factors like stress and diet can affect a person's chances of contracting cancer.